Like it or hate it, karaoke is a thriving industry that has a firm grip in almost every section of global pop culture. And it’s not going anywhere anytime soon. 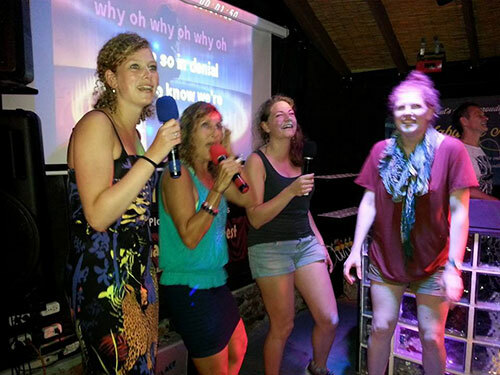 In June of this year, it was reported by SuperBox president Russell Stuart to PRWeb that karaoke stands today as a $10 billion dollar a year worldwide industry. 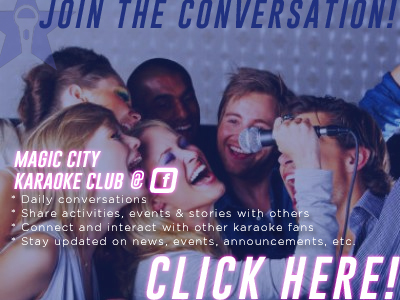 And although there have been sharp revenue declines in the karaoke bar business due to economic woes (two years ago, a 5% drop in revenue yearly was reported, according to Fast Company), the karaoke boom is not letting up. And history proves it. 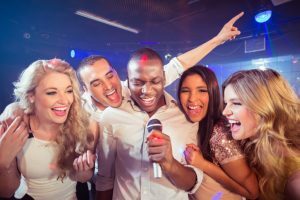 In the last few years, we’ve seen a stream of cultural advancements in the world of karaoke — from the popular Carpool Karaoke to the explosion of karaoke-oriented apps to the wide selection of talent shows now on the air (The Voice, America’s Got Talent) and karaoke-based shows of the past (Don’t Forget the Lyrics, The Singing Bee, Killer Karaoke). Check out this timeline of events, with roots almost going back to the turn of the 20th century. that traces the fascination and resilience of karaoke. 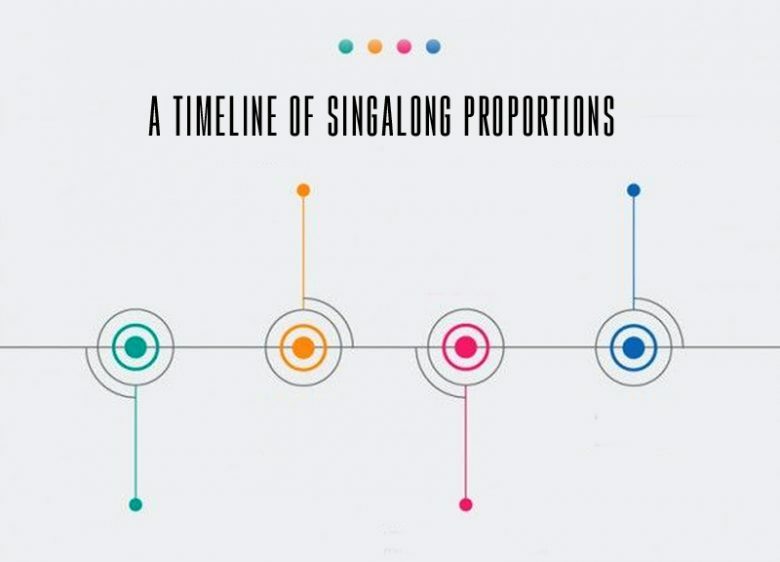 It may be hard for some to believe that the concept of the mass singalong was once beamed into the homes of many Americans back in the ’60’s, way before karaoke had a name. Think of the time when Prohibition-era saloons and bars brought in the coveted player piano as their new shiny toy, or when the jukebox was inserted and bar patrons would drop a quarter in just to start up a singalong to their favorite Hit Parade selection. Karaoke’s real origins start there, but the apex of the American karaoke experience really climaxed when Sing Along with Mitch hit the television airwaves in the early ’60’s. The series featured renowned jazz conductor and jazz producer Mitch Miller with a studio band and a singing male chorus as the lyrics to each song sprawled across the bottom of the screen. Contrary to popular belief, there was no bouncing ball that followed the time of the lyrics on Sing Along with Mitch. That idea was something that came from Screen Songs’ bouncing ball cartoons (produced mainly in the 1950’s) and Song Car-tunes’ “Following the Bouncing Ball” series (published in the 1920’s). Yeah, let that settle in for a minute. Origins of the karaoke experience go back that far. 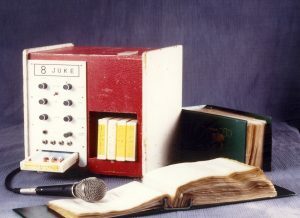 The father of karaoke, Daisuke Inoue, designed the first ever karaoke machine in 1971. After being bombarded with endless requests for his musicianship at the Utagoe coffeehouses he once worked for, Inoue set the motion to recording his own instrumentation to tape so that the music would play in his absence. The idea of this wasn’t all that foreign to the music world, as record companies would allow performers to tour with vocal-abstracted music, often dubbed as “minus-one” tracks. Still, it was an industry secret and not commercially viable. Inoue altered the playing field by creating the karaoke machine. Although he made multiple units of this and succeeded in making a market for the product in which The Atlantic cited “started to take off with an Atari-like speed,” he failed to patent the invention. That credit goes to Roberto del Rosario, a karaoke machine maker in the 1970’s and ’80’s. He would secure the first patent much later for his Karaoke Sing Along System in the Philippines (Utility Model 5269 dated June 2, 1983; Utility Model 6237 dated November 14, 1986). You can read more about Inoue and the creation of the karaoke machine in this 2005 interview. As for the name itself, Inoue doesn’t get the credit for that. Instead, sources trace it back to when a Japanese music group ordered a music-playing jukebox when musicians decided to go on strike. “It is said that someone from Matsuda [Electronics] looked into the pit and said, ‘The music is playing but the orchestra pit is empty!’ The phrase ’empty orchestra’ is kara okesutura in Japanese, which was shortened to form the word ‘karaoke. '” In Japanese, “kara” means “empty” and “oke” is short for “orchestra.” And there you have it. No real confirmation on when the term is used, but it had to predate when Inoue made the first machine. Ronco, a huge purveyor of home products and a huge boom in the consumer product catalog business, debuts Mr. Microphone at the height of the disco boom. This wireless contraption allowed participants to sing across the airwaves of their portable and car radio. It remained a popular novelty item in the Ronco stable, selling well into the early ’80’s. But of course, Ronco, whose first acclaim to fame was the Veg-o-Matic, moved on to better things. Or at last tried to. Originally karaoke tracks were recorded to tape in 8-track or cassette form, but the real game-changer in the karaoke biz came when CD+G was engineered and mass produced. Standing for “compact disc and graphics,” CD+G is credited as a creation of Philips and Sony, two of the leading developers in the CD market. On-screen graphics, usually low-quality images with song lyrics, were generally shot across the medium. In 1985, comedy troupe Firesign Theatre was the first to use CD+G publicly with Eat or Be Eaten, according to Bryan Brewer’s 1987 book The Compact Disc Book. By the late ’80’s, karaoke machines had moved away from tape to CD+G. A few video game consoles also jumped on the bandwagon, including Sega Saturn, Sega CD and the Atari Jaguar CD. In the U.S. Court of Appeals for the Second Circuit in New York, ABKCO Records, the famed publisher behind much of the Rolling Stones, jointly sued Stellar Records and karaoke producer Performance Tracks over the unfair usage of their material in their products. Although they didn’t use the original music and opted for recreations, Performance Tracks, like many other karaoke producers, viewed their works as “phonorecords.” Performance Tracks was only able to secure a mechanical license from ABKCO, but that wasn’t enough. The courts ruled in favor of ABKCO, citing that CD+Gs were not just audio-only phonorecords as the defendants suggested, but that the right to print lyrics were “qualitatively different from the right to synchronize a song with a visual image.” Seeking more than a simple mechanical license became the golden rule after this landmark case, a decision that forever separated the pros from the cons in the karaoke business. In June 2005, a similar lawsuit emerged that forced karaoke makers to obtain lyric synchronization licenses. Sybersound Records, a titan in the home-use karaoke market and the makers of the Party Tyme Karaoke CDs, challenged lower-end karaoke developers who were skating around an established law. One of those named in the actual lawsuit was The Singing Machine. In the Philippines, where Roberto del Rosario rocketed karaoke into a cultural pastime, is also where the karaoke microphone found its mojo. 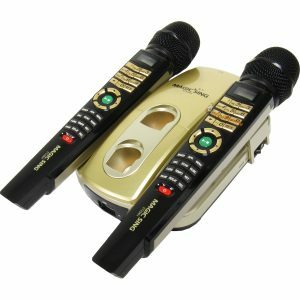 Tech company Enter Tech, founded in 1994, pushed their product — a portable karaoke microphone called Magic Sing. A wireless version of this, the ET-18000 would be introduced in 2007. Amateur talent/singing competitions predate the arrival of American Idol; just think Star Search, The Gong Show, Showtime at the Apollo‘s “Amateur Night.” Now they are everywhere. 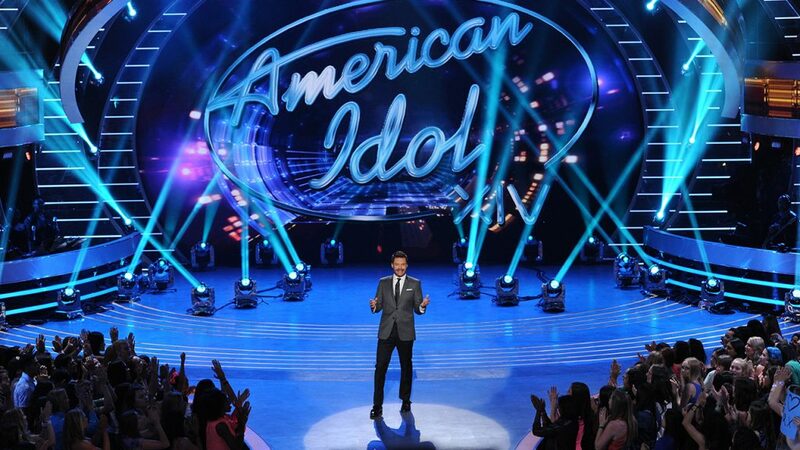 Still, American Idol deserves the golden trophy for putting karaoke in the hearts of millions. The television competition, once the golden child for the Fox television network, landed on American soil in 2002 as an import of the UK version, Pop Idol. In the early years, many of the performances from the show’s finalists were stamped with mediocre re-recordings that resembled most karaoke music tracks. And quite often, the panel of judges, most notably Simon Cowell — the King of Mean, would berate their lackluster performances with insulting jabs of them sounding like “karaoke.” It happened plenty of times, as ABC News put it: “Cowell leaves behind a repertoire of riffs, which he usually prefaced with ‘I’m sorry, but…’ or ‘I don’t mean to be rude, but…’ He turned the words ‘karaoke,’ ‘cabaret’ and ‘lounge singer’ into insults.” Regardless of Cowell’s crude remarks and boorish criticism, it transformed American Idol into a TV juggernaut, launching the careers of former amateurs into the pop ecosystem. And it also helped explode the karaoke market beyond its underground conventions. Especially when horrendous singers like William Hung, an Idol contestant who never survived the audition rounds, was given more than ten minutes of fame (see below). Origins of karaoke-styled gaming go back to the ’80’s (see Karaoke Studio on the Famicom, a predecessor to the Nintendo). But if you really want to see where the gaming explosion profited the most off of karaoke culture, fast forward to 2003 when Rock Band game developer Harmonix pumped Karaoke Revolution unto the leading game consoles of its day. 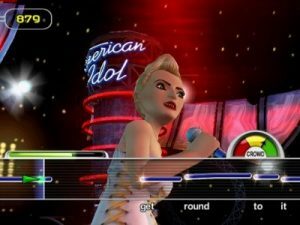 Its first game installations (Karaoke Revolution, Karaoke Revolution 2, Karaoke Revolution Party) featured covers of the originals, but a 2009 reboot was able to incorporate the original master tracks. They even cooked up a few console products for American Idol, which used the actual voices of the popular judges Simon Cowell, Paula Abdul and Randy Jackson for rapid feedback. Contrary to popular belief, the software didn’t detect if players were singing the right lyrics. Instead, it was most concerned about the pitch. A “pitch star” on the screen would show the pitch of the player and would provide the results if they were hitting all the right notes. A crowd meter would also gauge a person’s performance, with bad performances resulting in being heckled and booed. Karaoke Revolution was a hit until the music rhythm gaming market faced a nosedive, culminating with over-saturation of similar music video game products. Be sure to follow Magic City Karaoke on Facebook and Instagram.